The final step of installing new concrete is to seal it. Concrete sealant adds a surface luster that enhances overall appearance and is functional at the same time. A top layer of sealant protects new concrete pavement from inclement weather conditions and the dirt traffic can cause. Well-sealed concrete will resist stains and make oil or gas leaks easier to clean up. Use these steps to seal new concrete and protect the surface for long-term durability. Check that the new concrete is completely set. Verify that at least two full days have passed since the concrete was poured. 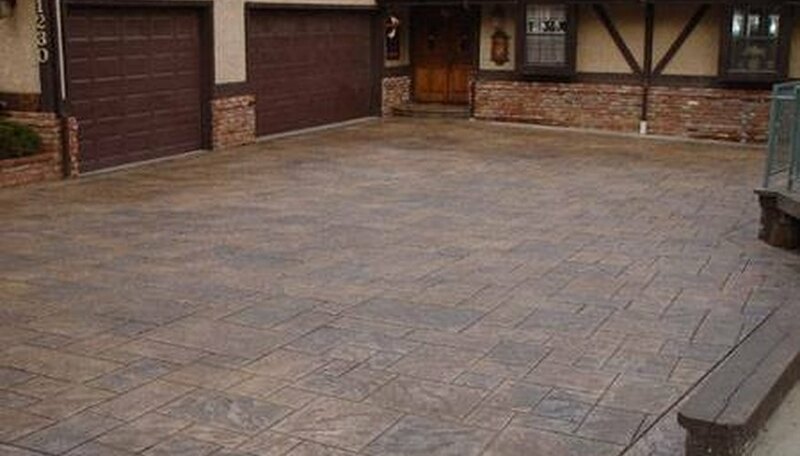 Allow a longer time if the concrete provider specified three or more days to cure. Sweep the concrete clean with a heavy-duty utility broom to remove dirt and any debris that may have accumulated since it was poured. Ensure that all joints and grooves are clean, too. Load a tube of polyurethane self-leveling joint sealer into a caulk gun. Snip the end off of the tube. Squeeze the self-leveling sealer into joints and grooves using steady, even pressure on the caulk gun lever. Allow the joint sealer to spread out and set up for a minimum of 2 hours or longer, if indicated on the sealer tube label. Open liquid concrete sealer and stir with a stir stick using figure 8 motions until completely mixed. Pour liquid sealer into the paint tray until the tray is half full. Roll the long-handled paint roller in the tray until it is full of sealer. Spread the sealer onto the concrete surface maintaining steady pressure on the roller. Continue refilling the paint tray with sealer and applying it until the new concrete surface is covered entirely. Allow the sealer to dry 4 hours or longer as indicated by the manufacturer's label. Apply a second coat of sealer across the entire concrete surface. Leave it to sit at least a day before allowing any traffic on the new concrete. Choose a dry sunny day to apply sealer to new concrete so that no rain or damp weather conditions interfere with drying. What is the Thickness of a Concrete Driveway? Why Did My New Concrete Driveway Peel & Flake?